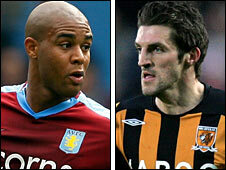 Bolton Wanderers have signed defenders Zat Knight from Aston Villa and Sam Ricketts from Hull City. The pair have agreed three-year deals at the Reebok Stadium after arriving for undisclosed fees. They are Bolton boss Gary Megson's third and fourth signings this summer as he looks to strengthen his squad. Megson has already picked up midfielder Sean Davis from Portsmouth while defender Paul Robinson signed from West Bromwich Albion on a season-long loan. After impressive displays for Fulham, centre-back Knight, 29, was capped by England against Colombia and the United States of America in 2005. The 6ft 6ins defender joined Villa from Fulham in 2007 for £3.5m but has struggled for regular first-team football and started only 13 Premier League games last season. Full-back Ricketts, 27, who has 34 caps for Wales, started 27 of the Tigers' Premier League games last season and has made 129 appearances for Hull in his three years on Humberside. Megson is also close to bringing in South Korean Lee Chung-Yong from FC Seoul according to the K-League side. The 21-year-old international spent last week on trial with Bolton and his club side said they expect a £2.1m deal to be completed soon. "The contract will be signed officially after a work permit is issued," FC Seoul said in a statement. Lee returned to Seoul on Friday confident the deal would go ahead. "In about 15 days I should get the work permit. Until it comes, I will spend my time training as hard as possible," he said. "To adjust quickly, I need to get to know my team-mates. I met manager Gary Megson a few times. He spoke to me but as I can't speak English, I couldn't understand him."